nice to speak with you just now. My organization, the Los Angeles Creative Club, is made up of art directors and copywriters in Southern California. We're a non-profit group, and every year we host a competition for creative work done by advertising students from around the world. It's a high-profile event within the advertising world. Many ad agencies look forward to our competition every year to find new talent for their creative staffs. 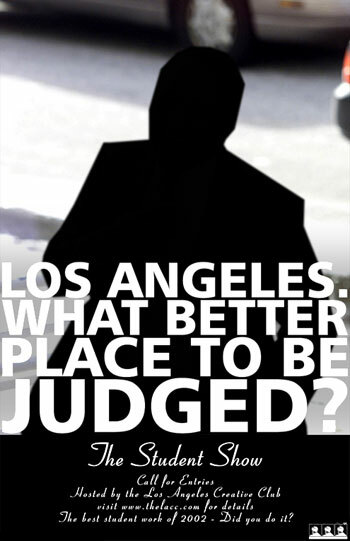 The theme for this year's show, which will be featured in posters going to advertising schools all over the world, as well as advertising agencies throughout the United States is: "Why have your work judged in Los Angeles?" One of our creative teams came up with an idea for the "call for entries" poster which features an image of your client, Mr. Simpson. Of course, we wouldn't use it without your client's permission. We couldn't afford much by way of a usage fee, but I hope you might see some benefit from having your client's image featured on a poster displayed in ad agencies throughout the United States, basically promoting the idea that Mr. Simpson is available for endorsement work. We will let you know when we get a response. Sometimes this can take a while. please be patient. Thank you for thinking of us, but at this time we are declining any participation with O.J. Simpson concerning your advertising campaign efforts. Also, Mr. Galanter has conveyed that the visual which have been created cannot be used in any advertising, public relations, marketing, direct mail, website, etc. Again, we are declining any and all participation towards this initiative per Yale Galanter. Thank you for your interest in O.J. Simpson and we appreciate you contacting us.